The sommelier oversees the lists at the Las Vegas resort’s 32 venues. 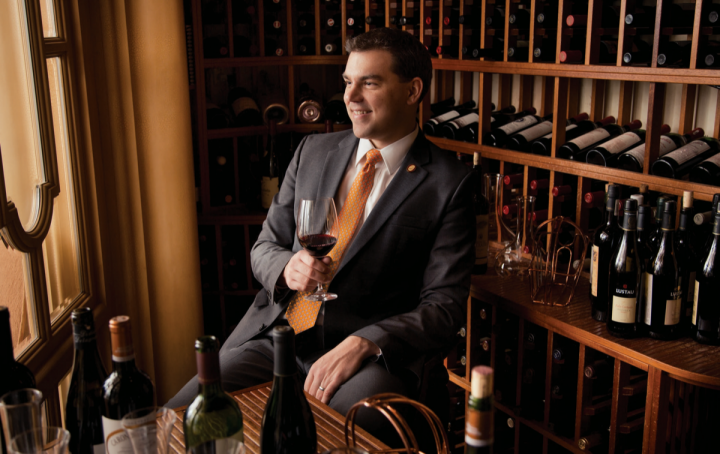 As master sommelier and wine director at Bellagio, Jason Smith manages nearly 100,000 bottles. From its iconic fountains to its lobby with art-glass ceilings, Bellagio Casino & Resort in Las Vegas draws in the crowds. Wine is poured at 32 dining venues on the MGM property, and Jason Smith—Bellagio’s master sommelier and wine director since 2008—is charged with making the wine experience magical. Some of Bellagio’s wine-destination restaurants include Picasso, Michael Mina Bellagio, Prime and Lago by Julian Serrano. Smith manages almost 100,000 bottles spanning about 5,000 labels. He also oversees wine training for roughly 3,500 service employees and works with 17 additional sommeliers. Across the Bellagio property, about 250 wines are available by the glass. Every day, wine is delivered from Bellagio’s temperature-controlled warehouse to its restaurants by forklift. Smith earned his master sommelier certification in 2005 and his particular expertise is in Burgundy and small-production California wineries. After graduating from the Culinary Institute of America, he worked at such venues as Charlie Trotter’s in Chicago, the 21 Club in New York City and The Little Nell in Aspen, Colorado. In 2006, he started at Bellagio as head sommelier at Michael Mina. In his two years there, he nearly doubled the list by adding 350 wines, including numerous Burgundies. At Picasso, the 2014 Morgadío Albariño Rías Baixas ($59 a 750-ml. bottle) and the 2013 Failla Sonoma Coast Chardonnay ($17 a six-ounce pour; $64 a 750-ml. bottle) are the top-selling whites. For the Asian-inspired appetizers at Prime and Michael Mina, Smith recommends German Riesling, such as the 2012 Joh. Jos. Prüm Mosel Wehlener Sonnenuhr Spätlese Riesling ($110 a 750-ml. bottle). At Prime, both the 2012 Lewis Cellars Napa Cabernet Sauvignon ($210) and the 2008 Silver Oak Alexander Valley Cabernet Sauvignon ($151) are popular with steak. At Michael Mina, Smith works with the chef and sommeliers to develop wine pairings for the various tasting menus ($65 to $88 for six 3-ounce pours). Las Vegas’ celebratory vibe calls for bubbles, and Smith likes to introduce guests to vintage bottlings of grower Champagne such as the 2004 Vilmart & Cie. Coeur de Cuvée Brut ($335 a 750-ml. bottle) and the 2005 Pierre Gimonnet Special Club ($199). Smith suggests the 1998 Ruinart Dom Ruinart Brut ($925) with caviar at Michael Mina. Smith’s most progressive pairings have combined wine with artwork at the Bellagio Gallery of Fine Art, where he has teamed up with the gallery’s director to create monthly art-and-wine pairings ($34 to $42). Smith has led wine discussions and provided notes on how the artwork evokes certain flavors. For instance, he has explained why the 2010 Ferrari-Carano Sonoma Sauvignon Blanc pairs with Claude Monet’s Meadow. Although he’s no longer on the floor every night, Smith still works at all of Bellagio’s special events.